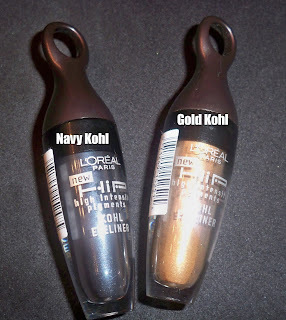 Whenever I get questions from viewers asking for affordable makeup brands that are comparable to favorites like MAC, Urban Decay and Makeup Forever, the L'Oreal HIP brand is always on my list. Their colors are vibrant, bright, and fun...yet wearable at the same time. They always come out new, innovative products. I had the opportunity to try out a few of their most recent releases. How cool is this product? When you take off the cap, you have a slanted tip applicator with two holes to dispense the two different lip colors. 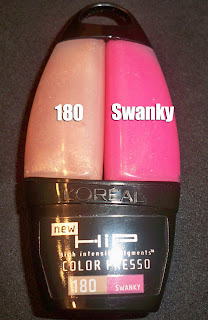 The glosses are housed in squeezy type tubes. You can wear each individually or squeeze both sides at once and wear a combo of both. That's 3 glosses in one if you think about it. -Might be difficult to press both sides at once to get a mix of the shades. -The cap was a little difficult to get off. I expected to twist it, but you have to pop it off. The first time I got it off, it popped off 5 feet in front of me, lol. 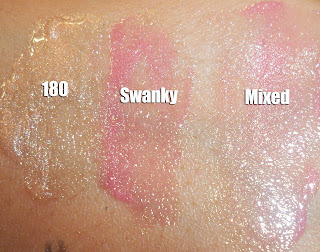 Check out hand swatches of each gloss. I show you each individually as well as the mixed shade. Check out the mixed shade on my lips. 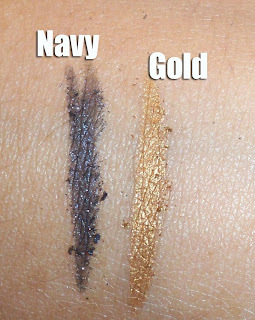 You can see how the gloss has more shimmers as opposed to the shiny/glossy effect. -There is a bit of fallout after applying the product. Make sure to shake the excess powder off the applicator when you apply. -The large applicator might not apply the thinnest line. Check out these products in your nearest drug store or cosmetics aisle. Till next time, Ciao Bellas! I think I prefer more gloss than shimmer to smooth out the lines in my lips.. By the way I'm having a giveaway competition on BeautySwatch.com where you can feature your favourite lipstick or gloss! thanks for the review. i've heard some nice things about the new HIP products. may give them a try later on this year. I was always interested in the kohl liners. 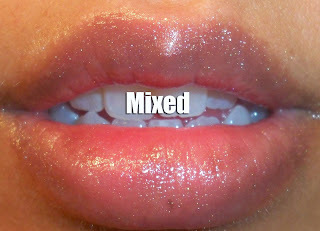 i always wondered how that gloss worked, three glosses in one, yet you mix it magically. what do you mean you wish u ate pork? ur flip! course you eat pork! Oohh... Wow, awesome.. Thanks, for the review! Ooh, the kohl's look interesting. Too bad Canada has a sucky HIP collection.